Water scarcity is the lack of sufficient available water resources to meet the demands of water usage within a region. It already affects every continent and around 2.8 billion people around the world at least one month out of every year. More than 1.2 billion people lack access to clean drinking water. Water scarcity involves water stress, water shortage or deficits, and water crisis. While the concept of water stress is relatively new, it is the difficulty of obtaining sources of fresh water for use during a period of time and may result in further depletion and deterioration of available water resources. 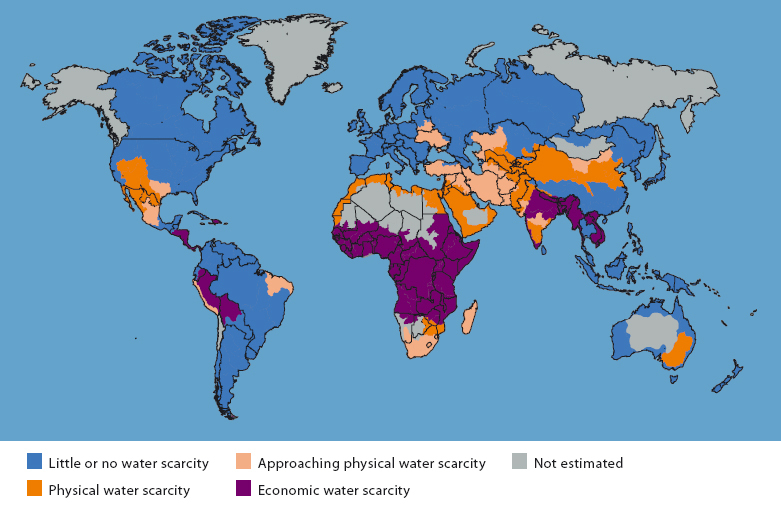 Water shortages may be caused by climate change, such as altered weather patterns including droughts or floods, increased pollution, and increased human demand and overuse of water. A water crisis is a situation where the available potable, unpolluted water within a region is less than that region's demand. Water scarcity is being driven by two converging phenomena: growing freshwater use and depletion of usable freshwater resources. Water scarcity can be a result of two mechanisms: physical (absolute) water scarcity and economic water scarcity, where physical water scarcity is a result of inadequate natural water resources to supply a region's demand, and economic water scarcity is a result of poor management of the sufficient available water resources. The reduction of water scarcity is a goal of many countries and governments. The UN recognizes the importance of reducing the number of people without sustainable access to clean water and sanitation. The Millennium Development Goals within the United Nations Millennium Declaration state that by 2015 they resolve to "halve the proportion of people who are unable to reach or to afford safe drinking water." Watch the first 17 minutes and take detailed notes on the history of oil extraction, peak oil and the advantages and disadvantages of different forms of energy.